A lack of B2B Marketing and Sales alignment....or sabotage? 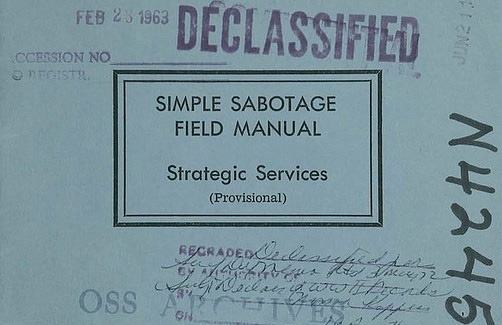 The manual codified a doctrine of support for local saboteurs supporting Allied war efforts, and developed tactics which could be trained and locally employed. And it provided a number of suggestions for kinetic, destructive acts of sabotage. But it also recognized another type. A second type of simple sabotage requires no destructive tools whatsoever and produces physical damage, if any, by highly indirect means. It is based on universal opportunities to make faulty decisions, to adopt a non-cooperative attitude, and to induce others to follow suit. Making a faulty decision may be simple a matter of placing tools in one spot instead of another. A non-cooperative attitude may involve nothing more than creating an unpleasant situation among one's fellow workers, engaging in bickerings, or displaying surliness and stupidity. This type of activity, sometimes referred to as the "human element," is frequently responsible for accidents, delays, and general obstruction even under normal conditions. The potential saboteur should discover what types of faulty decisions and non-cooperation are normally found in his kind of work and should then devise his sabotage so as to enlarge that "margin for error." As I read that (in case you are wondering if I sat down and read the manual, the answer is no. I skimmed the first couple pages and noticed that excerpt) it happened to echo a couple conversations I've had recently regarding B2B marketing and sales alignment; why that alignment seems so challenging; and even whether it is embedded in the system or the result of willful intransigence. And then as my thoughts wandered further, whether the continuum we tend to use to describe alignment - something from lack of collaboration to splendidly aligned - may fail to capture the essence of the challenge in some cases. Is our lexicon so imbued with an expectation of collaboration and supportive terminology that we actually overlook internal sabotage? The reality is that we all know that sabotage does occur sometimes - and perhaps more frequently than it's acknowledged. Further the silo structure of many organizations means that resource allocation and performance metrics are rigid and perpetual - there's no motivation or justification for alignment in some cases. In short, many of the attitudes are ossified within companies and conflict is institutionally fomented between departments. Just as there are a precious few well aligned teams, and a few cases of clear antagonism and internal sabotage by or of B2B marketing, the majority are generally aware of market changes but not how they're impacting the revenue growth funnel (the old concept of marketing funnel followed by a sales funnel is now outdated) and the implications to how they execute. Despite the rafts of information that have been written about this, it still remains frustratingly unclear for many companies. So we're tackling that challenge. We're creating the Illustrated Guide to B2B Marketing and Sales Alignment. It's proving a bit more daunting a challenge than we anticipated and taking a bit longer - but it's getting incredibly exciting. It's not an overstatement to say that it will change the way many B2B companies view their revenue growth function. Want a copy when it's done? (probably mid-late July) Fill out the quick form below and I'll personally ensure that you get it promptly. Want a copy as soon as it's done?